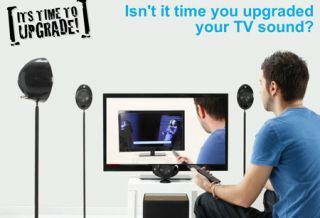 Clarity Alliance focuses on poor TV sound quality with first advertising campaign | What Hi-Fi? The hi-fi and home cinema industry's new trade alliance is hoping to get consumers to focus on getting better performance from their kit, with the launch of an advertising campaign called "It's Time To Upgrade"
Clarity, the hi-fi and home cinema industry's new trade alliance, has launched its first advertising campaign to focus consumers on getting better performance from their sound and vision products. The first campaign focuses on the poor quality of sound from flatscreen TVs, something which we can certainly relate to. The campaign, called 'It's Time To Upgrade', uses a two-minute video, which will be pushed on YouTube, Facebook, Google+ and the new 'It's Time To Upgrade' website. The video gives consumers a number of options for getting better sound from their TV, and will guide them to their local specialist retailer where they can investigate further. Launching the campaign Alan Sircom, chairman of Clarity, said, “One of the primary reasons for setting up Clarity was to help raise awareness of the hi-fi and home cinema industry with consumers who are blissfully unaware of how good home entertainment can be. "We need to introduce new customers to what we do, visiting the shops and buying the products that our manufacturers spend months and years developing. "By focusing the first campaign on an issue that is really simple to understand, namely how bad TVs sound these days compared to the amazing pictures they give, we hope to attract the attention of people who have never given this any thought but will appreciate it when it is pointed out." Clarity launched at the start of the year with six key aims and objectives, and this is the first advertising campaign.